Today Romanian, German and international environmental protection organisations call for a joint appeal to permanently protect these virgin and old-growth forests. Read the statement below as well as the full pdf. To help save Paradise forests you can lend a helping hand by participating in the 100 stickers in 100 cities campaign and sign a petition! Statement of international environmental organisations for the protection of Romanian primary and natural forests! Romania’s forests are part of an outstanding European natural heritage. 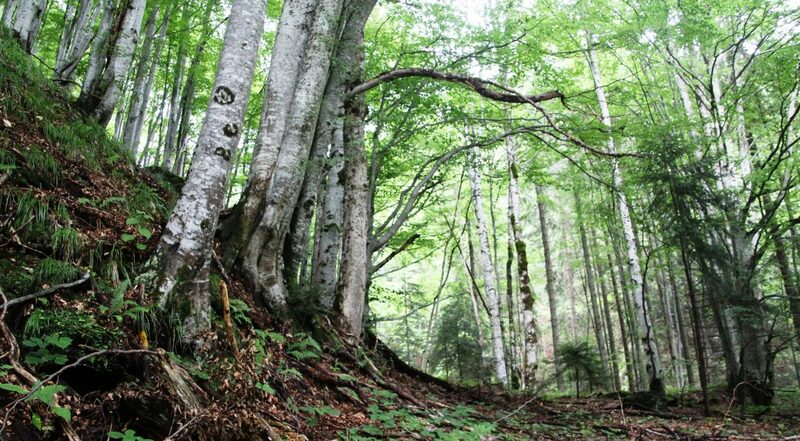 They include some of the largest remaining stands of virgin forests in Europe. Together with other large areas of biodiversity-rich and negligibly disturbed natural forests, they form one of Europe’s most important natural treasures. These forests are of tremendous value in safeguarding ecological diversity and remaining intact ecosystems. In addition, they store huge amounts of carbon and thus help to stabilise the global climate. Romanian virgin and natural forests are among the few remaining refuges for European brown bears, wolves and lynx and host numerous endemic species. Much of these forests are located in protected areas such as national parks, Biosphere Reserves and Natura 2000 sites. Nonetheless, highly valuable forests are being progressively logged in these protected areas. The European Habitat Directive prohibits significant degradation or deterioration of protected habitats and species in Natura 2000 sites. Since the European Court of Justice ruled on the Białowieża case, it has become clear that logging of species-rich old growth forests in Natura 2000 sites is incompatible with EU Nature directives. An inventory (Veen / Biris, 2004) previously identified 218,000 hectares of primary and natural forest in Romania. However, many of these have been destroyed in the meantime – before the eyes of Romanian governments and the EU. This development in Romania is causing great concern among many scientists and civil society organisations worldwide. Not even in national parks and United Nations Educational, Scientific and Cultural Organization (UNESCO) World Heritage natural sites are these forests safe. The World Heritage sites by no means include all of the primary beech forests. Furthermore, national parks fail the minimum requirement of having 75 percent strictly protected core zone as recommended by the World Conservation Union (IUCN). In all buffer zones (national parks and UNESCO world heritage sites) intensive commercial forestry is ongoing. Logging also affects highly valuable primary and natural forest that have the same “outstanding universal value” (OUV) as the UNESCO core areas. In some national parks, such as the Semenic Cheile-Carasului, there are even efforts to reduce the core areas in order to increase logging within the park. As a result, these forests, which are unique in Europe, are progressively being lost. A variety of reports reveal that there appears to be a massive and nationwide problem with corruption and illegal practices in Romanian forestry. Neither the enforcement of national laws nor compliance with international law (in particular in Natura 2000 sites) are sufficiently secure. The Romanian nature conservation organization Agent Green and the international EuroNatur Foundation got hold of leaked information from secret parts of the second National Forest Inventory. According to this information the average annual felling is 38 million cubic metres, but only 18 million cubic metres are covered by approved forest management plans. The Romanian state forest management Romsilva, administrates 12 out of 13 national parks. This implies a special responsibility to implement nature protection obligation. But what they do is exactly the opposite: Logging dominates the park’s buffer zones, and park staff and members of scientific committees seem to be pressured or removed if they criticise damage to high conservation value forests from intense logging. We are also extremely concerned about reports of physical violence and threats against environmentalists and scientists. This is unacceptable anywhere, and certainly in an EU member state. Dear Minister Gavrilescu, Minister Deneş and Mr Mihailescu, we ask you to fulfil your responsibilities and act immediately to put an end to the destructive and illegal practices in Romania’s forests. We urge you to uphold the law, and to fulfil our shared obligation to ensure the protection of this natural heritage. The primary and natural forests of Romania are invaluable for the biosphere and ecosystem-services of our planet. Encouragement of ecologically sustainable and close to nature forest management in commercial forests outside protected forest areas. We look to Romania during its EU Presidency in the first half of 2019 and ask you to take this unique opportunity to show the rest of the EU that Romania takes its environmental responsibilities seriously. We kindly ask that you inform us before the EU summit on 9 May 2019 about what measures you will now take to effectively protect this outstanding European natural heritage.